It was in Strasbourg in 1570 that the very first edition of the oldest Christmas market in Europe took place, and then called the "Christkindelsmärik" (market of the Infant Jesus). Since this time, Strasbourg has continued the tradition of a traditional, authentic, warm and generous Alsatian Christmas. However, Strasbourg is not the only town to host Christmas Markets. The arrival of the little wooden huts in the town squares of Alsace's towns and villages is also a major event. The Christmas markets mark the return of time-honoured festivities. A world of delicious fragrances, delightful craft goods and lights quickly takes shape along the rows, where some surprising and mouth-watering discoveries await the markets’ visitors. Begin the day from Strasbourg and head towards Colmar. Christmas in Colmar’s Historical town centre means a historic setting made magical by amazing Christmas illuminations that blend perfectly with the wonderful lighting designed to enhance the town’s heritage. The pedestrian city centre with its major architectural treasures that stretch from the Middle Ages to the 19th century is decorated like in a dream, a veritable open-air theatre where the warm Christmas mood envelops the heart of the town. Here, enjoy some free time in the city to discover one or several Christmas Markets on your own, as the town holds 5 different markets. Then continue along the famous Alsace Wine Route to pass through some of the most beautiful villages of Alsace. The afternoon program will depend on the date of your tour. Eguisheim or Bergheim (Christmas Cribs tour) villages host a market every single day. On the 25th, 26th and 27th of November you will certainly stop in Kaysersberg where one of the most authentic Christmas markets is held. 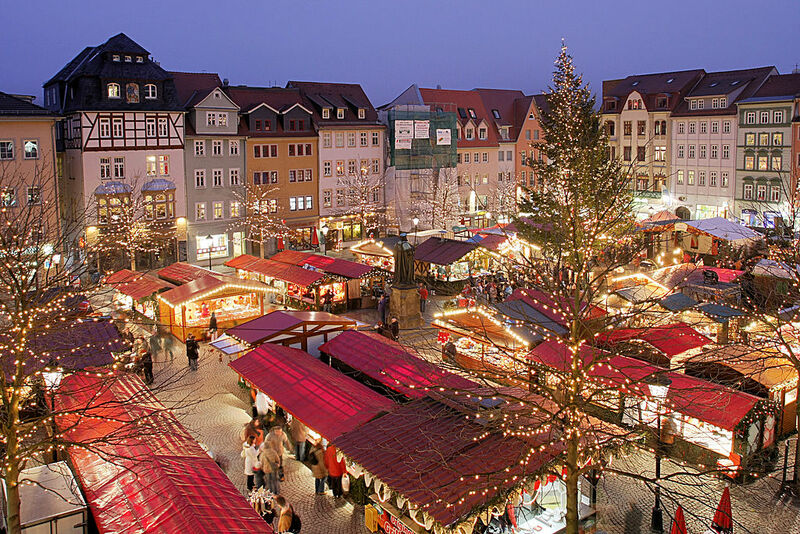 On the 3rd/4th and 10th/11th of December, your stop will certainly include the Christmas Markets of Riquewihr or Ribeauvillé as this is when he medieval markets are being held.